Shelling reported in southern Yemen as truce between rebels and Saudi-backed pro-government forces comes into force. Shelling was reported in southern Yemen on Sunday night, just as a humanitarian truce between rebels and Saudi-backed pro-government forces came into force, the BBC reported. The Houthi rebel artillery pounded residential areas near the city of Taiz, witnesses said. However, the capital Sanaa and central Yemen are understood to be quiet. Before the truce was due to begin, clashes were reported at a major air base north of Aden after government allies took the nearby town of Sabr, according to the BBC. The Saudi-led coalition had said on Sunday it would halt air raids at midnight local time (20:59 GMT) to let much-needed humanitarian aid in. 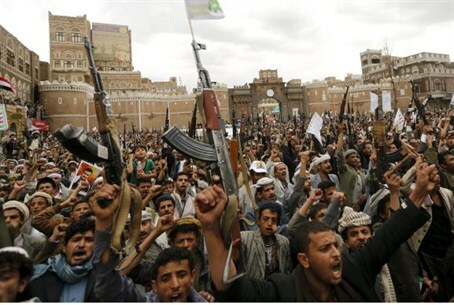 But a Houthi spokesman said the rebels would not adopt a position on the move until they were officially informed. The unexpected ceasefire was announced after Yemen's President Abdrabbuh Mansour Hadi wrote to Saudi's King Salman asking for a break, to allow humanitarian supplies to be delivered, according to the BBC. A Saudi Arabian-led alliance began launching airstrikes on the Iranian-backed Houthi rebels on March 26. The airstrikes are aimed at restoring Hadi, who was forced to flee to Saudi Arabia after the rebels seized the capital, Sanaa, in September. It is believed Iran is planning to use the Houthis to take over Yemen and seize the key strategic port of Aden, which controls the entrance to the Red Sea and ultimately to the Israeli resort city of Eilat. Last month Yemen's exiled government and the Houthi rebels failed to agree on a temporary ceasefire during UN-brokered talks. The Houthis, for their part, had called for a temporary ceasefire, but the government rejected it, saying the rebels had used a previous humanitarian pause to grab more land.